Are Nuts Good or Bad for Diabetes? 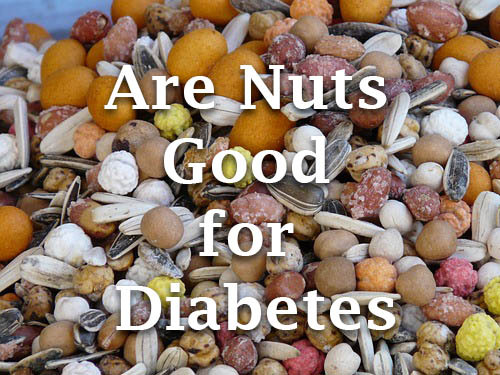 You are here: Home / Foods / Are Nuts Good or Bad for Diabetes? Nuts! Can nuts help prevent diabetes? Can nuts help control diabetes? Are nuts a healthy snack or just another fad? Should you include nuts in your diet? The simple answer is yes—though, read on, because there are some caveats (aren’t there always…) to the simple “yes” answer. The USDA’s “Choose My Plate” program designed to help people make healthy eating choices included nuts in the Protein Foods Group, but nuts are high in a number of other nutrients as well, including fiber, the heart healthy monounsaturated and polyunsaturated fats, healthy omega-3 fats, vitamins and minerals. Nuts are also high in anti-oxidants. One thing to note is that nuts are also high in calories. However, while noting that, it is also important to remember that while you DO want to watch your calories, you are getting an awful lot of healthy nutrition along with those calories and are NOT getting a lot of sugars, cholesterol or unhealthy fats (the sorts of unhealthy saturated fats that can clog up arteries). The way you can get the health benefits of nuts without paying a large “calorie price” is to use nuts as a between-meal snack and decreasing the other high-protein servings such as meat as needed. How Do I Find I Out If I Have An Eating Disorder? A one ounce serving is about 1 handful of nuts—the number of nuts in a handful can vary from 6-9 Brazil nuts, 20-24 almonds, 18-20 hazelnuts, 9-14 walnuts, 18-20 pecans, about 50 pistachios, 16-18 cashews and about 150 pine nuts. For adults, the USDA recommends 5-6.5 ounce equivalents of protein a day and nuts can be 1-2 of those ounces. By the way, an “ounce equivalent” is the term used by the USDA in place of “serving”. Minerals: Phosphorus, zinc, copper, iron, magnesium, selenium and manganese. Brazil nuts contain one of the best sources of selenium, an important mineral necessary for anti-inflammatory biochemical reactions—Brazil nuts contain almost 8 times the DV for selenium. Minerals: zinc, copper, iron, magnesium, selenium and manganese. Minerals: Calcium phosphorus, zinc, copper, iron, magnesium, selenium and manganese. Minerals: Phosphorus, zinc, copper, iron, magnesium, and manganese. Minerals: Calcium, phosphorus, zinc, copper, iron, magnesium, selenium and manganese. What are Blood Sugar Target Ranges? What Is The Normal Blood Sugar Level? How Can Your Diabetes Affect Your Friends, Family & Others Around You? Beyond these commonly given nutrition facts, nuts as a group also is high in plant flavonoids (antioxidants, anti-inflammatory agents), plant sterols (known to benefit heart health) and plant proanthocyanidins (also antioxidants and anti-inflammatory agents). Flavonoids are also being investigated as anti-cancer agents, both for prevention and for treatment. But….are Nuts Good in a Diabetes Meal Plan? In addition, a recent large study—a meta-analysis of many other studies—indicated that eating tree nuts can improve the control of blood sugar in people with diabetes. The study was limited by the fact that many of the studies that were included were small and not of high quality, but that is exactly the advantage of a meta-analysis. In some ways, a meta-analysis is designed to be a way to statistically “smooth out” less than perfect data and “root out” the underlying information. Other studies have indicated that including walnuts in the diet reduces the risk of diabetes in women. Not all nuts are created equal—regarding diabetes, walnuts and pistachios are among the best studied. In fact, pistachios have been shown to lower the risk of diabetes in those already diagnosed with prediabetes. However, it is likely that mixed nuts or just your favorite nuts will be beneficial, so there is no need to worry about which specific nut is best—they are pretty much all great to include in your diet. So, how much is enough? Most of the studies have looked at the benefits of including 1 handful of nuts every day. You can stick with walnuts and pistachios, but you can also try any of the tree nuts or just used mixed nuts. A handful of nuts, remember, is only an ounce of nuts—and is under 200 calories. For most people, this should be relatively easy to incorporate into their diets. The current wisdom is that the benefits of a handful of nuts a day for heart health, blood pressure and glycemic control of diabetes outweigh the calorie number. So, go nuts! Afshin, Ashkan, et al. “Consumption of nuts and legumes and risk of incident ischemic heart disease, stroke, and diabetes: a systematic review and meta-analysis.” The American journal of clinical nutrition 100.1 (2014): 278-288. Viguiliouk, Effie, et al. “Effect of tree nuts on glycemic control in diabetes: a systematic review and meta-analysis of randomized controlled dietary trials.” PloS one 9.7 (2014): e103376. Pan, An, et al. “Walnut consumption is associated with lower risk of type 2 diabetes in women.” The Journal of nutrition 143.4 (2013): 512-518. Could you tell me the daily amount of pistachio nuts allowed for type 2 diabetic please? Why leave out the origins of Macadamia nuts ?? Yes they are from Australia and no the aborigines did not grow them as ornamental trees.